Background: Bone marrow examination is crucial diagnostic modality for evaluation of various hematological and nonhematological disorders. However, marrow aspirate smears and biopsy sections, even though performed simultaneously, are often assessed at different points of time due to different processing methods. This sometimes results in discordance in diagnosis which adds to the diagnostic dilemma and delays the treatment. aim: This study aims to compare the diagnostic accuracy and the rate of concordance between the two modalities of bone marrow examination. Materials and Methods: Three hundred simultaneously performed bone marrow aspirates and BM trephine biopsies were retrospectively analyzed over a period of 1 year. The presence or absence of concordance was recorded. The reasons for inconclusive reports were also recorded. The concordance rates for different hematological disorders were calculated and recorded as high for >80%, moderate for 50%–80%, and low for <50%. The findings of discordant cases and reasons for discordance were also tabulated. Results: A high concordance was found in cases of megaloblastic anemia, leukemias, non-Hodgkin's lymphoma, and multiple myeloma; moderate concordance was found in hypoplastic marrow and concordance was low in Hodgkin's lymphoma, chronic myeloid leukemia (CML) in blast phase, metastatic, and granulomatous involvement of bone marrow. Conclusion: Bone marrow aspiration alone is sufficient for the diagnosis of megaloblastic anemia and most of the hematological malignancies. Bone marrow biopsy is more appropriate for detection of disorders with focal marrow involvement such as lymphoproliferative disorders, metastatic cancer, focal blast crisis in CML, granulomatous lesions, and hypoplastic marrow. However, it is strongly recommended that both should be reviewed simultaneously to ensure maximum diagnostic accuracy. Bone marrow examination is crucial diagnostic modality for evaluation of various hematological and nonhematological disorders. It is an indispensable prognostic modality and an essential component of the follow-up schedule of patients undergoing chemotherapy or bone marrow transplantation. There are three basic preparation of bone marrow (BM) examination: BM aspiration (BMA) cytology, BM touch imprint cytology, and BM trephine biopsy. While BMA is a simple and rapid technique of marrow evaluation allowing excellent visualization of cell morphology, trephine biopsy provides a more comprehensive information about the marrow cellularity, trilineage hematopoiesis, and architectural pattern of infiltrative marrow diseases. The diagnostic accuracy of the two diagnostic modalities differs for different conditions. Simultaneous assessment of marrow aspirate and biopsy allows a more detailed marrow assessment which may be impossible to achieve with the use of any one approach alone. However, marrow aspirate smears and biopsy sections, even though performed simultaneously, are often assessed at different points of time. Processing of BM biopsy (BMB) is a lengthy and tedious procedure, while aspiration is a rapid technique of marrow evaluation. The hematopathologist often views the aspirate in isolation from the biopsy as it is processed rapidly. The marrow sections are received in the Department of Histopathology and likewise reported by a trained histopathologist who may not have a steady access to the aspirate smears. Most of the time, the results are concordant, but discordant results can occur. This discordance leads to perplexity about the diagnosis and delays treatment. We attempted to compare the diagnostic accuracy and determine the rate of concordance between the two modalities to ascertain whether simultaneous assessment of marrow aspirates and biopsy sections serves as a better approach to solve the diagnostic dilemma and improves the diagnostic accuracy or not. Three hundred simultaneously performed BMA and BM trephine biopsies reported at our institution over a period of 1 year, i.e., July 2013 to September 2014 were retrospectively analyzed. 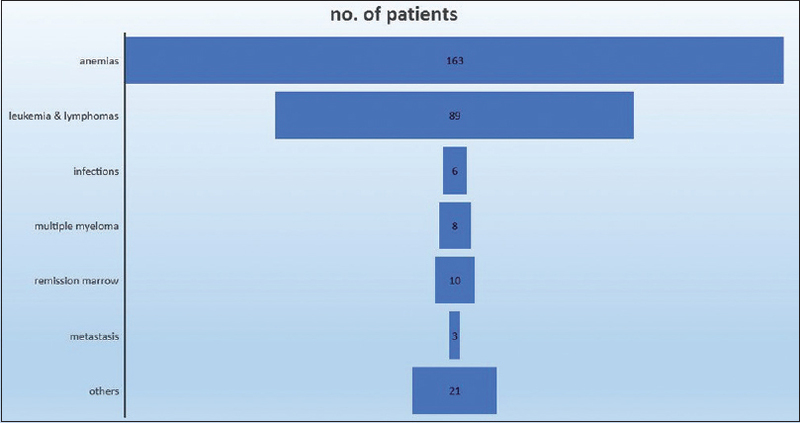 Bone marrow examination was carried out for a variety of indications and patients belonged to a wide age range from 1 to 65 years [Figure 1]. Relevant clinical details and results of previous investigations such as complete blood count, peripheral blood smear, reticulocyte count, and coagulation profile were also reviewed. BMA and BMB had been performed simultaneously for all the patients. BMA had been done using Salah's marrow puncture needle and 20 ml syringe from PSIS. The aspirated material was smeared on clean glass slides. Thereafter, trephine biopsy was taken using Jamshidi's needle through the same incision. The biopsy was taken approximately 0.5–1 cm away from site of aspiration to avoid hemorrhagic biopsy. A peripheral blood film was also prepared simultaneously. PBS and BMA were stained with Wright's stain. The trephine biopsies were fixed in 10% neutral buffered formalin and were subjected to decalcification in 5.5% ethylenediaminetetraacetic acid solution for 72 h. Thereafter, the length of biopsy was noted and it was subjected to the routine processing schedule in automated tissue processor and then embedded in paraffin. 2–3 μm thick sections were cut and stained with hematoxylin and eosin. Histochemical stains were done on additional sections wherever indicated. Reticulin and Masson's trichrome stains were performed to grade bone marrow fibrosis. Immunohistochemistry was done by standard streptavidin biotinylated peroxidase method. The bone marrow smears had been seen and reported by hematopathologist while the biopsy had been reported by histopathologist. Thus, both the pathologists were blinded to each other's reports. The reports of both aspirate and biopsy for each case were reviewed and compared. The presence or absence of concordance was recorded. The reasons for inconclusive reports were also recorded. The concordance rates for different hematological disorders were calculated and recorded as high for >80%, moderate for 50%–80%, and low for <50%. The findings of discordant cases and reasons for discordance were tabulated. Out of the total 300 cases analyzed retrospectively, 60 bone marrow biopsies were found to be inadequate for opinion. Out of these, 37 were of insufficient length, 14 comprised of only cartilage and bone while 7 showed only the presence of blood clot. A total of 240 BMB were evaluated for concordance with BMA. Concordant results were found in 198/240 cases resulting in an overall concordance of 77.1%. The distribution of diagnoses of different cases is shown in [Figure 1]. Concordance rates for different hematological disorders are shown in [Table 1]. [Figure 2] shows a comparison of the concordance rates. A high concordance was found in cases of megaloblastic anemia with 38/44 (86.3%) cases showing concordant results. In the six discordant cases, marrow aspirate showed erythroid hyperplasia alone in 4 cases and was diluted in remaining 2 cases. High concordance was observed also in cases of acute leukemia (88%) of which 25 cases were analyzed and aspirate correlated with biopsy in 22 cases [Figure 3] while it was diluted with blood in the remaining 3 cases. There was a concordance of 92.3% (12/13) among cases of chronic myeloid leukemia chronic phase (CMLCP) and a concordance of 100% in cases of chronic lymphoproliferative disorder [Figure 4]. One case of CML-CP showed myelofibrosis on trephine section and so resulted in dry tap and inadequate marrow aspirate. Cases of non-Hodgkin's lymphoma (NHL) and multiple myeloma (MM) also showed high concordance of 88.9% (8/9) and 85.7% (6/7), respectively. The reason for discordance is focal deposits in BMB in a case of NHL [Figure 5]. In cases of hypoplastic marrow, the BM aspirates were concordant with trephine biopsy in 60% (12/20) of the cases [Figure 6]. Aspirates were reported as normocellular marrow in 7 cases due to the presence of focal hypercellularity. The concordance rate was observed to be low for cases of CML in blast phase which was diagnosed in 7 cases on BM trephine biopsy while aspirates showed concordant findings in only 3 of these cases resulting in a low concordance rate of 42.8%. Two of the aspirates were reported as CML-CP while remaining two aspirates were diluted due to the presence of marrow fibrosis causing dry tap. Concordance rates were low also in cases of Hodgkin's lymphoma [Figure 7] where aspirates correlated with biopsy in only 10 of the 25 cases resulting in a low concordance rate of 40%. Reasons for discordance were recorded as focal infiltration of bone marrow by lymphoma and inadequate bone marrow sampling. Metastatic involvement of bone marrow was diagnosed in 3 cases on BMB [Figure 8]. However, only one BM aspirate showed metastatic deposits producing a concordance of only 33.3%. Focal involvement of BM by metastasis resulted in low concordance. 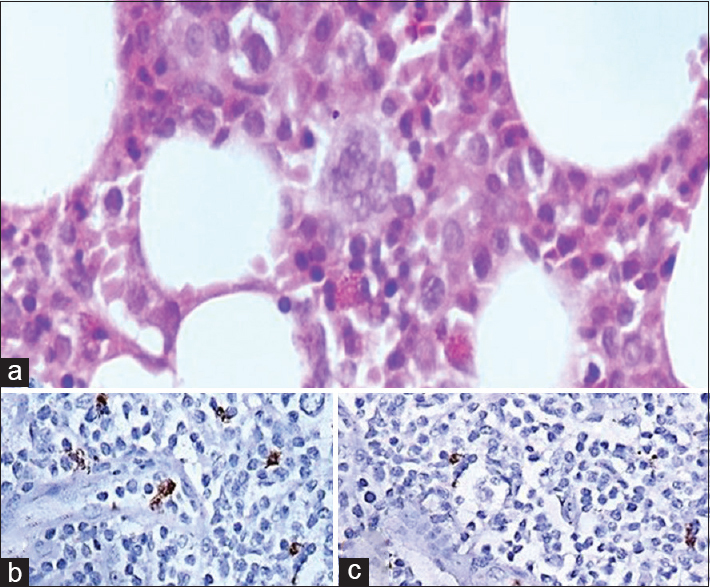 Six bone marrow trephine biopsies showed granulomatous involvement of BM while none of the simultaneously performed marrow aspirates showed the presence of granulomas [Figure 9]. Hence, in cases of granulomatous myelitis, concordance rate was observed to be 0%. A comparative evaluation of simultaneously performed but separately reported BMA and BMB for various indications showed a positive correlation in 77.1% of the cases. The results obtained are similar to those of other comparable studies which showed concordance rates varying from 61.25% to 80.5%.,, However, the sensitivity of BMA as a diagnostic procedure depends on the disease being evaluated. Diseases with diffuse involvement of BM are diagnosed with adequate sensitivity by BMA alone. High concordance rate was obtained in a considerable proportion of cases of acute leukemia, and BMA alone may suffice as a diagnostic procedure in most of the cases. Immunophenotypic analysis of aspirated material can further comprehend the diagnosis and help to further categorize the leukemia. However, a marrow completely replaced by blasts or immature myeloid precursors is often difficult to aspirate and results in a dry tap or inadequate aspirate as seen in 3 of our cases. Thus, BMB is essential in all such cases. BMB complements the peripheral blood and aspirate findings in providing additional information for diagnosis and especially prognosis of acute leukemia. BMA was found to be highly sensitive in diagnosis of NHL and MM. A case of NHL showed focal involvement of bone marrow which was diagnosed on BMB alone by histopathologist. Focal infiltration is more common than diffuse in B-cell lymphomas while diffuse infiltration is relatively more common in T-cell lymphomas. Similarly, trephine biopsy helped to identify focal compact masses of plasma cells in a case of MM which could not be diagnosed by the hematologist on BMA alone. The pattern of infiltration can only be fully assessed by examining sections from trephine biopsy specimens. Furthermore, biopsy is more helpful for quantifying plasma cell burden (using CD 138 immunohistochemistry), especially in patients with low percentage of plasma cells on aspirate. However, cytomorphological classification of myeloma is better done on aspirate or imprint smear (mature, intermediary, immature, and plasmablastic types). In a study conducted to evaluate the relative merits and prognostic value of BMA and BMB in the assessment of bone marrow infiltration in B-cell chronic lymphocytic leukemia, it was found that bone marrow histological pattern (BMP) was an independent prognostic factor for survival while percentage of lymphocytes in BMA (lymphocytic infiltration) only had independent predictive value in stage A patients. The interobserver reproducibility and agreement were higher for bone marrow histological pattern than for lymphocytic infiltration. Only 40% aspirates from patients with marrow involvement by Hodgkin's disease were positive. Rest of the aspirates were either inadequate owing to marrow fibrosis or were taken from nonrepresentative area of a marrow which is only focally infiltrated by Hodgkin's disease. Thus, BMA does not have much role in cases of marrow involvement by Hodgkin's lymphoma. On the other hand, BMB is an important part of staging in stage IIB or III cases and hence alters the treatment. Foci of fibrosis in the absence of classical or variant RS cells with Hodgkin's lymphoma diagnosed elsewhere are highly suspicious of marrow involvement. Furthermore, an additional advantage of trephine biopsy specimen is that immunohistochemical studies can be performed on sections of paraffin-embedded tissue which is useful in establishing or confirming the nature of lymphoid infiltrates. Among chronic myeloproliferative disorders (CMPDs), BMA shows high diagnostic accuracy in cases of CML-CP but low sensitivity for diagnosis of CML-blast phase (BP). Two of the aspirates of CML-BP were nondiagnostic owing to fibrosis while remaining two discordant cases were reported as CML-CP on BMA owing to the presence of focal blast crisis as observed later on BMB by the histopathologist. Role of trephine biopsy is not only in differentiation of CMPDs but also to assess the overall marrow cellularity, histotopography and morphology of megakaryocytes and blasts (CD 34+ precursors) and degree of myelofibrosis. In cases of megaloblastic anemia, findings of BMA were concordant with those of BMB in significant number of cases. However, morphological identification of megaloblastic change was mistaken for acute leukemia [Figure 10] as the biopsy was reported without reviewing the peripheral blood and marrow aspirate findings. 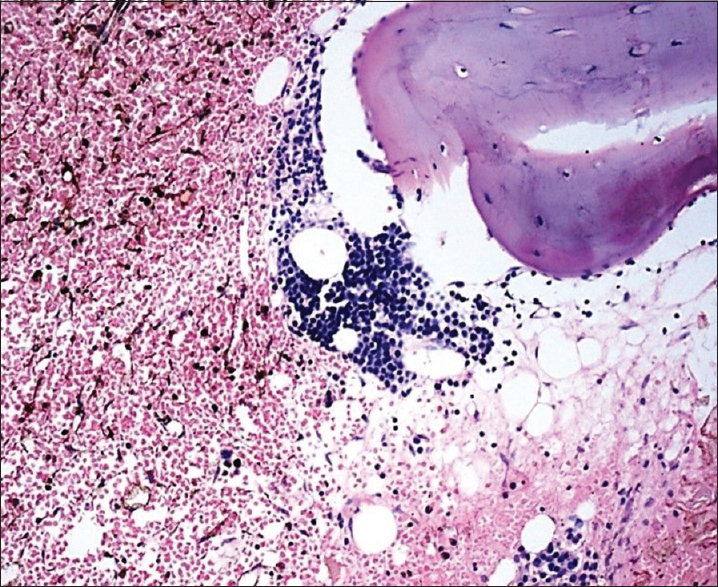 In cases of hypoplastic bone marrow, moderate concordance was found and findings were suggestive of normocellular marrow in the discordant cases. This is explained on the basis of the presence of focal areas of slightly increased cellularity or hotspots in an otherwise profoundly hypocellular marrow. Trephine biopsy gives the qualitative and quantitative assessment of cellularity and therefore is confirmatory in the diagnosis of aplastic anemia and overcomes the limitation of dry tap. Furthermore, biopsy can provide the number and distribution of megakaryocytes, lymphocytes, plasma cells in marrow and blasts, all of which are of prognostic value in follow-up of aplastic anemia. An important limitation of BMA is the admixing of marrow and sinusoidal blood, which may not allow for reliable estimates of marrow cellularity. Frequency of positive BMA in metastatic marrow varies from 23% to 100% in different studies.,,, Almost two-third of BMA from metastatic marrow disease did not show metastatic deposits. In a comparison of a large series of simultaneously performed BMA and BMB, a correlation of 75% was obtained for detection of metastatic neoplasms. Focal deposit of nonhematopoietic malignant cells and tumor-associated desmoplasia and necrosis are the causes of dry tap on aspiration. Kaur M, Singh Rana AP, Kapoor S, Puri A. Diagnostic value of bone marrow aspiration and biopsy in routine hematology practice. J Clin Diagn Res 2014;8:FC13-6. Bain BJ. Bone marrow trephine biopsy. J Clin Pathol 2001;54:737-42. Birb AR, Jacobs P. Trephine biopsy of the bone marrow. S Atr Med J 1963;64:271-276. Younus U, Saba K, Aijaz J, Bukhari MH, Naeem S. Significance of bone marrow histology in the diagnosis of acute myeloid leukemia. ANNALS 2011;17:5-8. Goyal S, Singh UR, Rusia U. Comparative evaluation of bone marrow aspirate with trephine biopsy in hematological disorders and determination of optimum trephine length in lymphoma infiltration. Mediterr J Hematol Infect Dis 2014;6:e2014002. Toi PC, Varghese RG, Rai R. Comparative evaluation of simultaneous bone marrow aspiration and bone marrow biopsy: An institutional experience. Indian J Hematol Blood Transfus 2010;26:41-4. Graf BL, Korte W, Schmid L, Schmid U, Cogliatti SB. Impact of aspirate smears and trephine biopsies in routine bone marrow diagnostics: A comparative study of 141 cases. Swiss Med Wkly 2005;135:151-9. Stifter S, Babarović E, Valković T, Seili-Bekafigo I, Stemberger C, Nacinović A, et al. Combined evaluation of bone marrow aspirate and biopsy is superior in the prognosis of multiple myeloma. Diagn Pathol 2010;5:30. Montserrat E, Villamor N, Reverter JC, Brugués RM, Tàssies D, Bosch F, et al. Bone marrow assessment in B-cell chronic lymphocytic leukaemia: Aspirate or biopsy? A comparative study in 258 patients. Br J Haematol 1996;93:111-6. Franco V, Tripodo C, Rizzo A, Stella M, Florena AM. 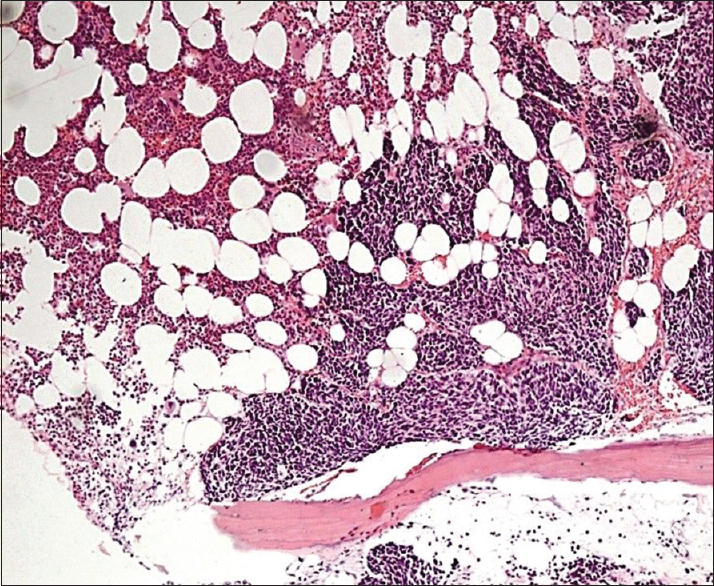 Bone marrow biopsy in Hodgkin's lymphoma. Eur J Haematol 2004;73:149-55. Kar R, Dutta S, Tyagi S. Clinically unsuspected Hodgkin's lymphoma diagnosed primarily from bone marrow trephine biopsy: Report of six cases. Indian J Pathol Microbiol 2008;51:186-9. Vardiman JW, Melo JV, Baccarani M, Thiele J. Chronic myelogenous leukemia, BCR-ABL1 positive. In: Swerdlow SH, Campo E, Harris NL, Jaffe ES, Pileri SA, Stein H, et al., editors. WHO Classification of Tumors of Hemtaopoietoic and Lymphoid Tissues. 4th ed. Lyon: International Agency for Research on Cancer; 2008. p. 32-7. Brunning R, McKenna RW. Atlas of Tumor Pathology. Tumors of the Bone Marrow. Washington, DC: Armed Forces Institute of Pathology, American Registry of Pathology; 1994. p. 323-67. Milosević R, Janković G, Antonijević N, Jovanović V, Babić D, Colović M, et al. 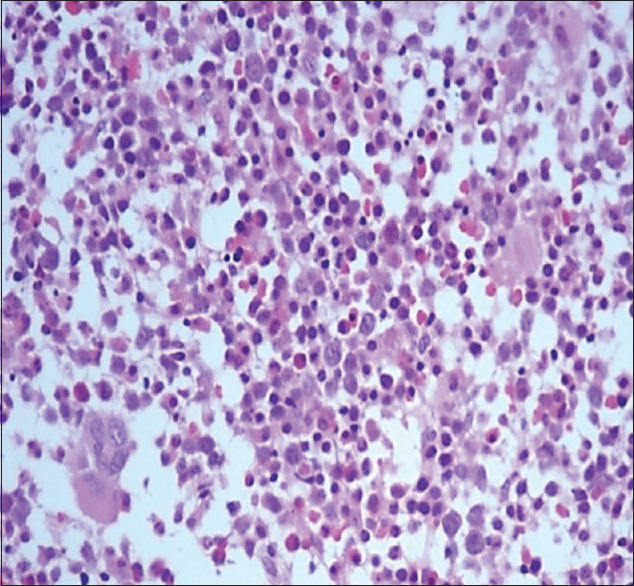 Histopathologic characteristics of bone marrow in patients with aplastic anemia. Srp Arh Celok Lek 2000;128:200-4. Atac B, Lawrence C, Goldberg SN. Metastatic tumor: The complementary role of the marrow aspirate and biopsy. Am J Med Sci 1991;302:211-3. Chandra S, Chandra H, Saini S. Bone marrow metastasis by solid tumors – Probable hematological indicators and comparison of bone marrow aspirate, touch imprint and trephine biopsy. Hematology 2010;15:368-72. Moid F, DePalma L. Comparison of relative value of bone marrow aspirates and bone marrow trephine biopsies in the diagnosis of solid tumor metastasis and Hodgkin lymphoma: Institutional experience and literature review. Arch Pathol Lab Med 2005;129:497-501. Sharma S, Murari M. Bone marrow involvement by metastatic solid tumors. Indian J Pathol Microbiol 2003;46:382-4. Savage RA, Hoffman GC, Shaker K. Diagnostic problems involved in detection of metastatic neoplasms by bone-marrow aspirate compared with needle biopsy. Am J Clin Pathol 1978;70:623-7.